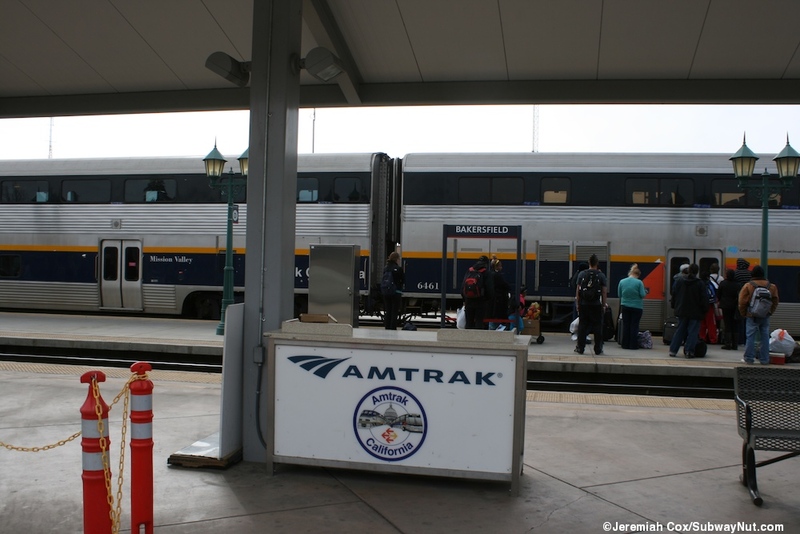 is the southern terminus of Amtrak's San Joaquin and sees six trains a day terminating. 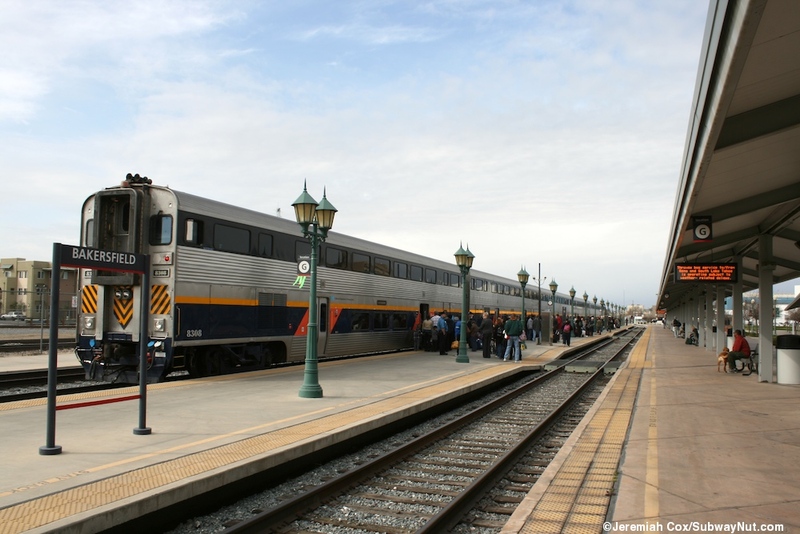 The stop has the facilities to store three trains overnight, with the three other daily trips getting same day turns at Bakersfield. 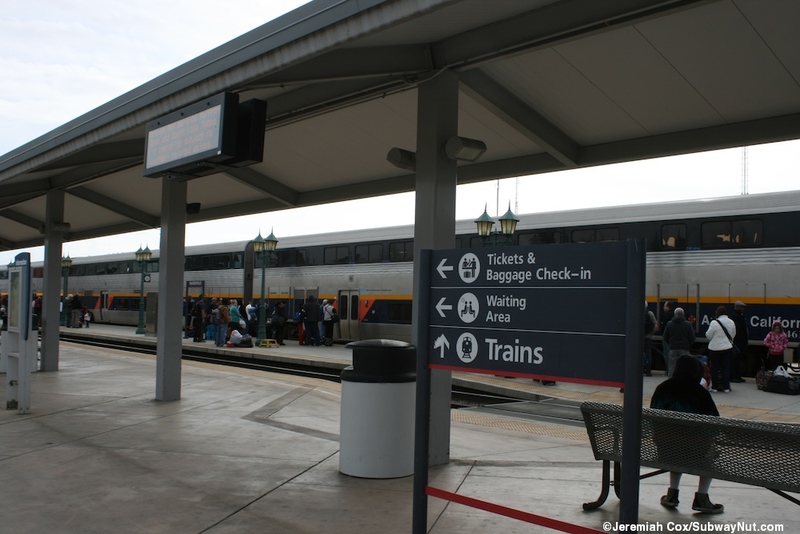 The station has always been the terminus of Amtrak's San Joaquin since its creation in 1974. 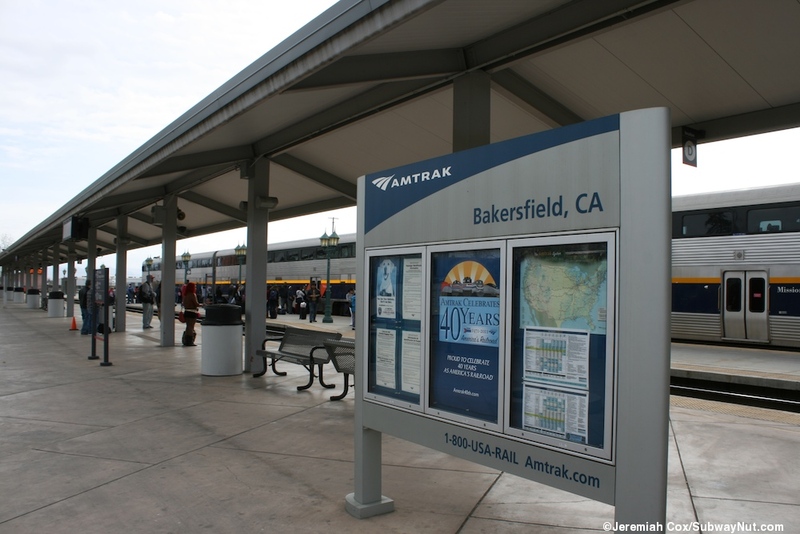 The current station was opened on July 4, 2000, replacing a smaller overcrowded depot located a mile west of the current station on 5th and F Streets, on the edge of the main Bakersfield freight yard slightly closer to the center town (in a place like Bakersfied fast freeway access is more important). 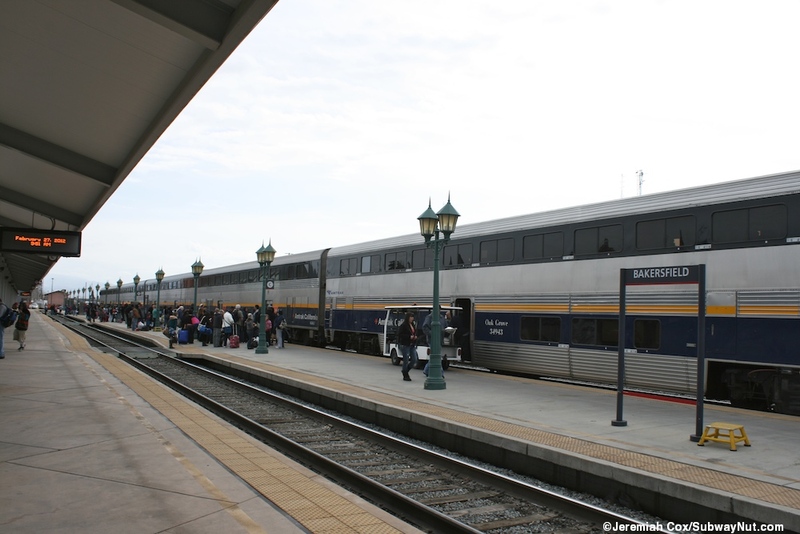 The station is the major transfer point to thruway buses (some white, some Amtrak California) for Southern California including Los Angeles for transfers to the Surfliner for San Diego and intermediate points. 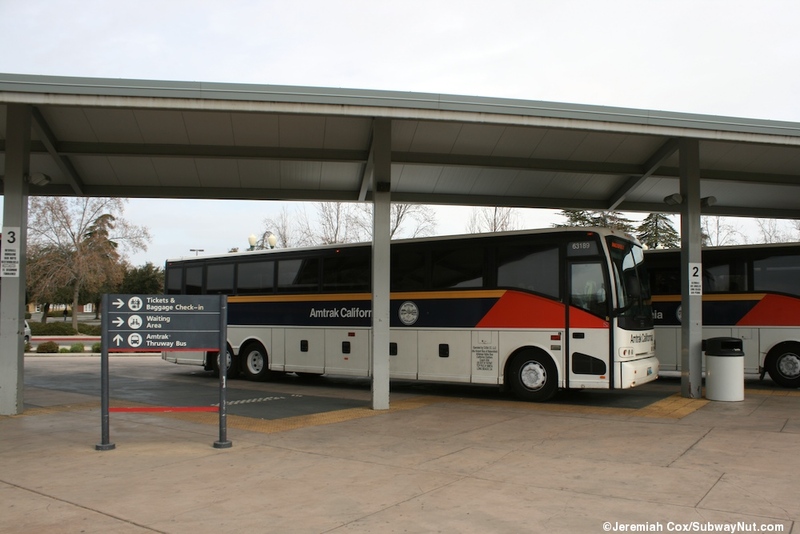 Baggage can even be transferred directly via buses and then back onto Sufliner trains, checked through for example from Merced to Santa Ana. 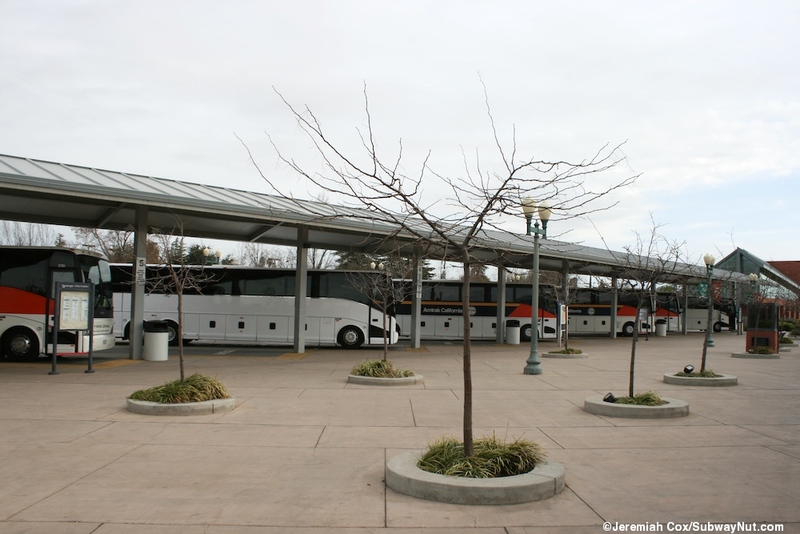 Buses reach as far as Los Vegas (one connection per day). 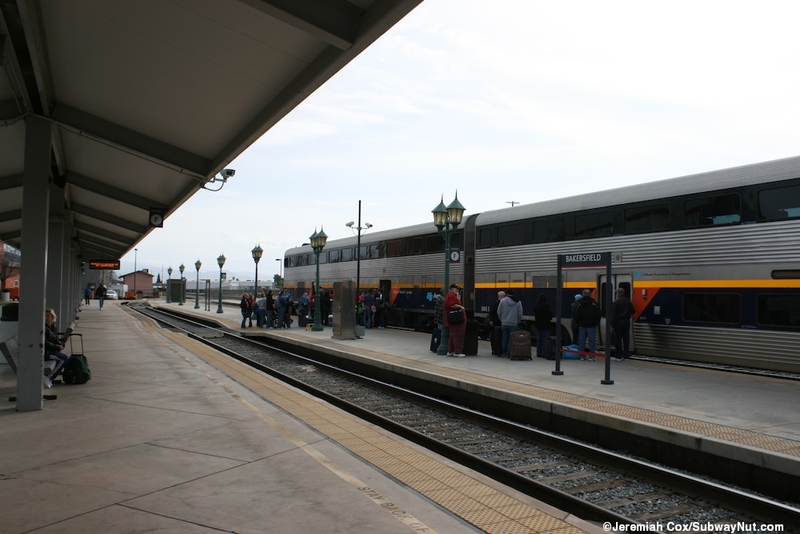 A regular train arrival often has six different buses connecting with the trip, all to different destinations beyond the mountains, although L.A.-Union Station can get two: one an express and one via Glendale. 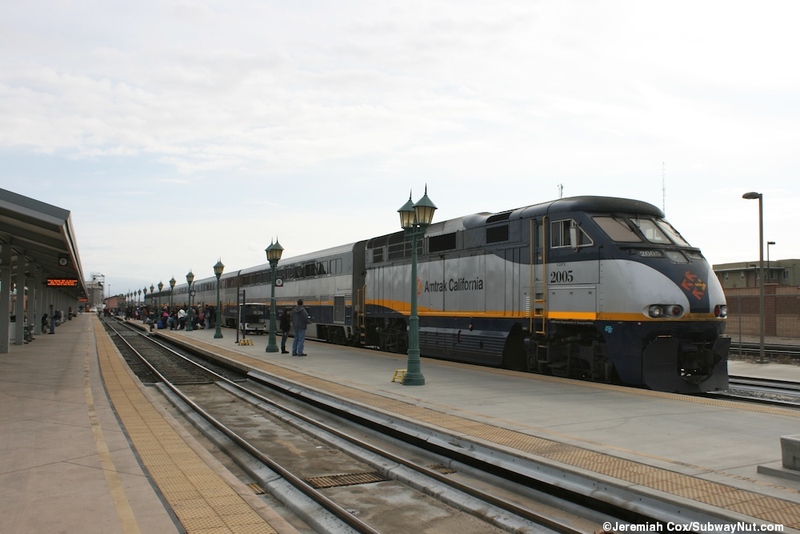 Train's can't continue south to LA because the BNSF railway used by Amtrak joins the UP a short ways beyond the station to cross Tehachapi pass via the Tehachapi Loop on one of the busiest stretch of single track railway. 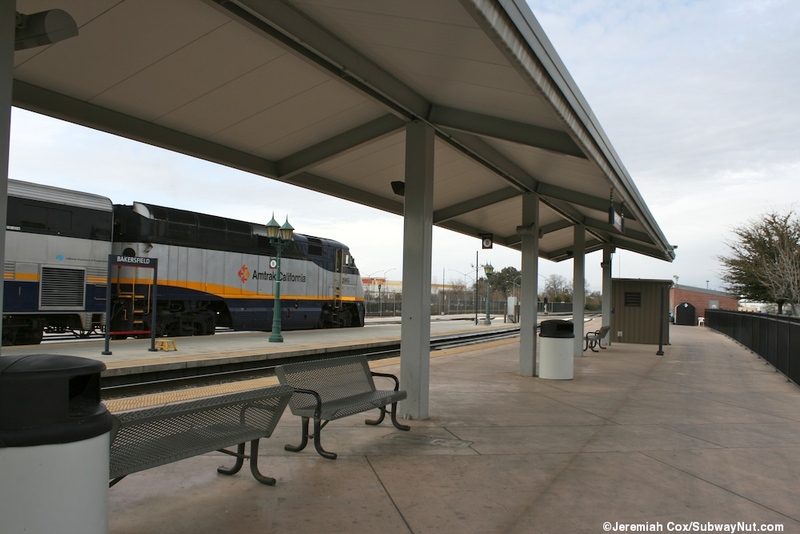 The train station is the only one on the San Joaquin route with no road grade crossings anywhere, just west (railway north) of the station Q Street passes beneath the and bus loop in an underpass. The station itself consists of 3 tracks that are basically on their own sidings separated by a fence from the two mainline tracks that they switch onto just west (railway north of the station). South of the station beyond where trains leave revenue service, the three tracks switch back onto one track, have another switch to one of the main line tracks before continuing as a siding and ending before Union Avenue's underpass. 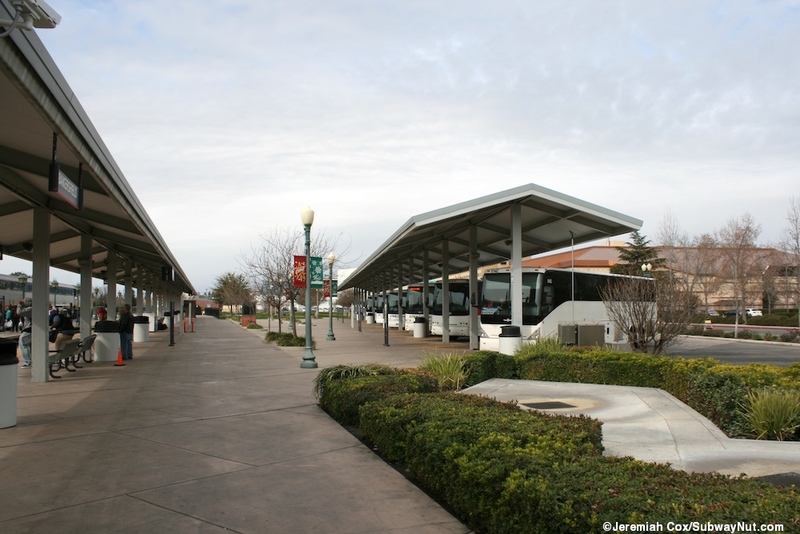 For platforms: the station has two, starting from the most northern track this platforms on two sides, one is a fully metal canopied side platform out to a wide plaza that leads to the stations bus loop where a line of buses pull in and up to the platform in separate bus bays (they have to back out of) beneath their own metal canopy structure. The plaza in between is mostly concrete with a few trees growing. There is a recently installed brown wheelchair lift enclosure on this platform as well. 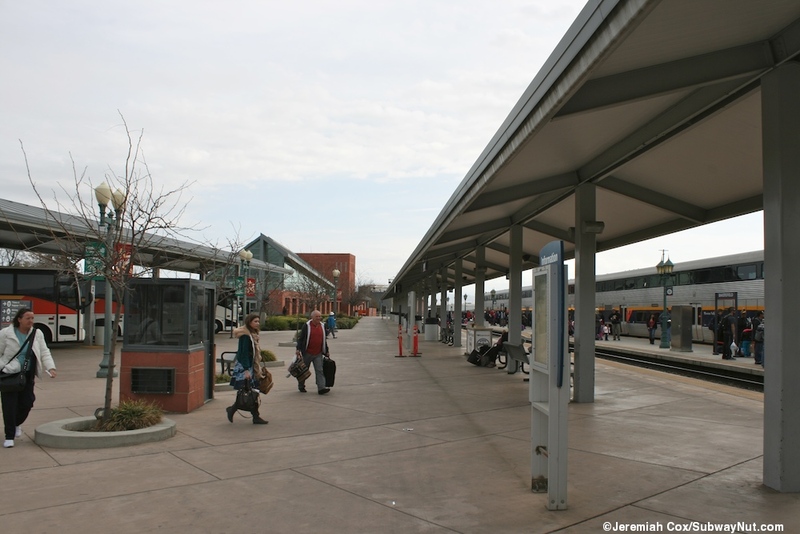 There is a second low-level platform between this north track and the middle track (the only track who's doors will open to this platform), this has just a line of green lampposts and previous generation Bakersfield signs. There are regular dips down to track level to allow crossing the north track to leave this second platform. The third track doesn't platform at all. Information panels, both the large modern ones and older smaller ones are scattered throughout the station. 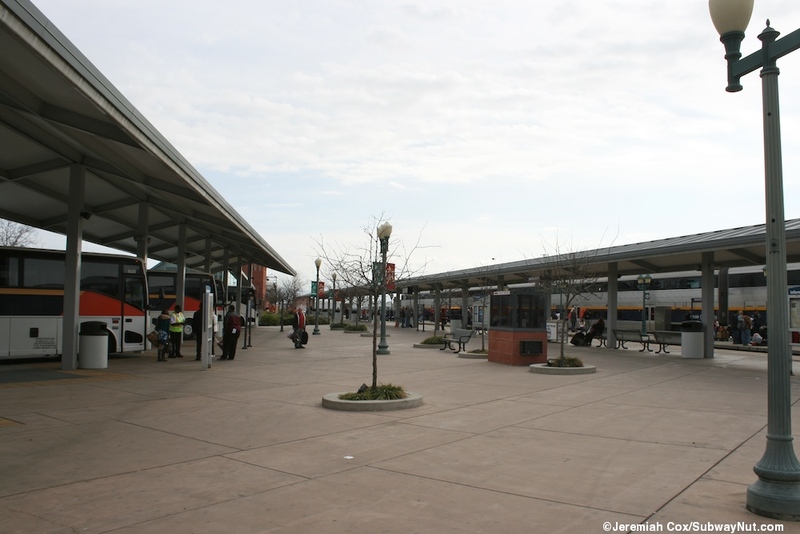 The depot is at the eastern end of the station beyond the bus bays, completed in 2000 is a modern building with cinderblock looking walls in a red stone color. 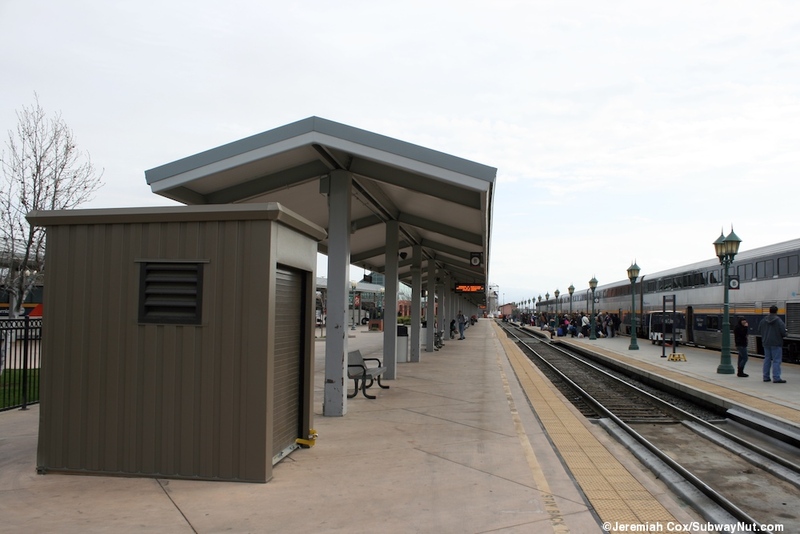 The roof is angled and peaked, and the waiting room that is closest to the tracks is as well. Glass, both from windows in the walls, and high windows between the modern roof (as well as skylights towards the top of the roof) pour light into the waiting room with some but minimal seating in nondescript attached black chairs. The only food is from vending machines, there are restrooms and a ticket office with baggage check in at the eastern end of the main lobby, here the glass ends and the red stones have silver ventilation openings and a modernist clock above. 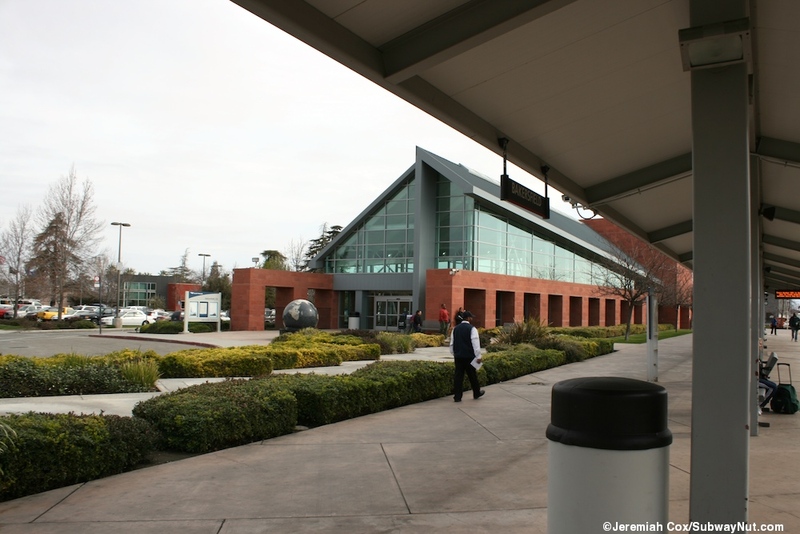 There are also two Quik-Trak machines here and the building has another single story wing that extends behind with non-public areas for baggage and other back office needs. 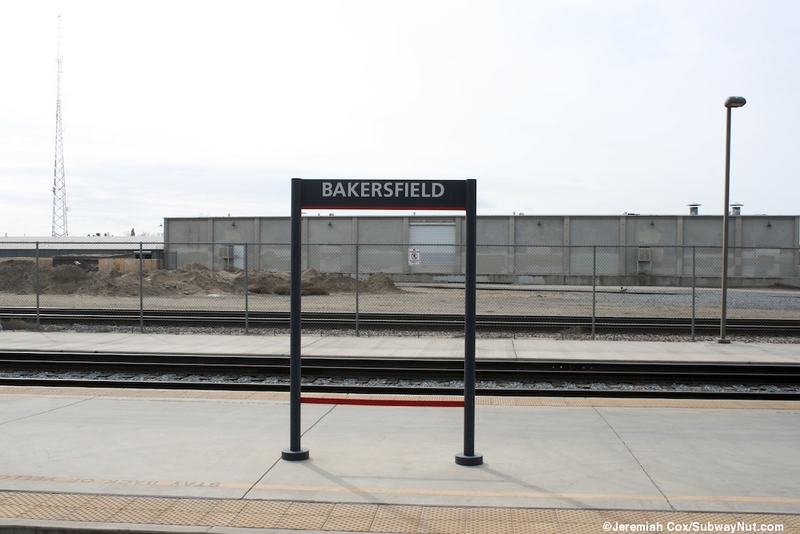 This central area dividing the public and non-public two sections of the building is taller and bakersfield is spelled vertically high on one side. 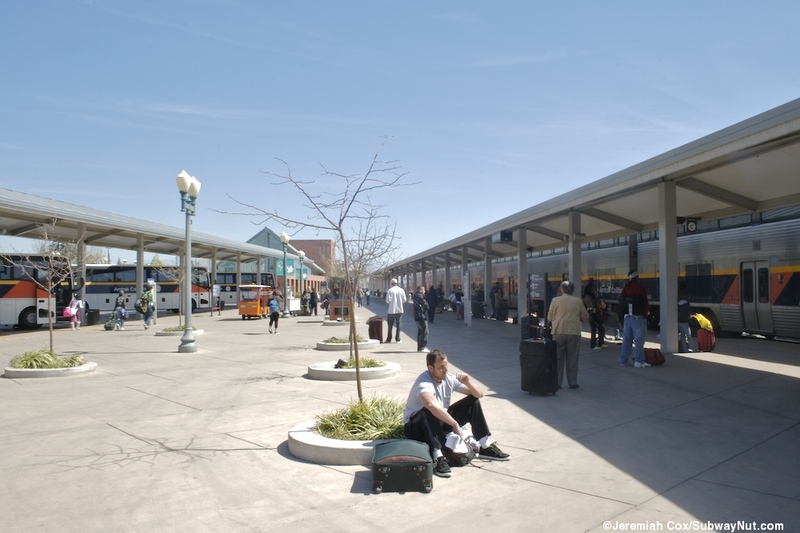 In the plaza outside the depot is a globe with a minimal water feature dedicated March 16, 2001: "In Recognition of Travel and Tourism's Contribution to Peace and Prosperity throughout the World." 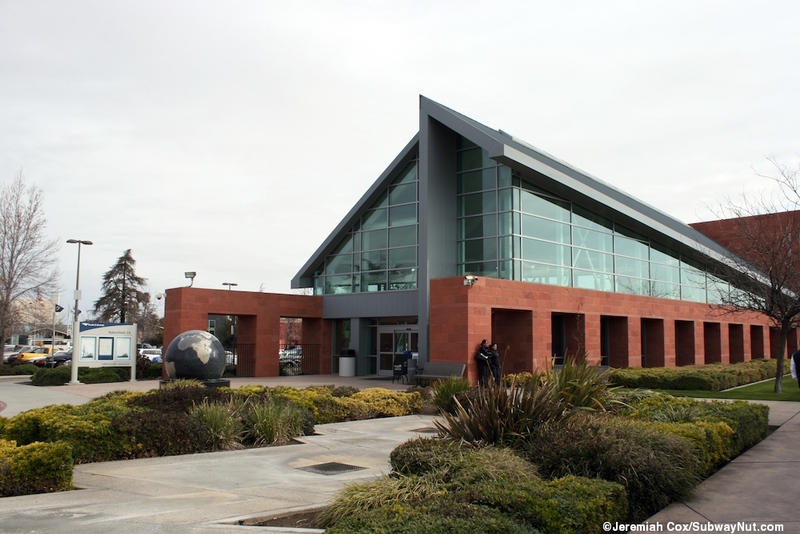 from the Hogan Family Foundation"On the same super-block of the station with parking lots in between is the modern Beale Memorial Library, the central branch of the Kern County Library, a modern building housing the Bakersfield Convention and Visitors Bureau, and the outdoor Bakersfield Veterans Memorial.